Not far from the outlet of Lake Baikal, on the north bank of the Angara, lies a village of 3,000 souls called “Little Big River”. Because Little Big River is on the main road to Baikal Lake, it is not drying up and blowing away like so many villages in Siberia. New homes are going up, additions are being built, renovation is afoot. The people I met there smiled warmly as they invited me in for a meal. (Which I took them up on, Russians are excellent hosts, and always see to the needs of their guests. If you are in Russia, and someone invites you to have a meal at their table, you should ALWAYS accept.) While beautiful, Little Big River is not idyllic. A walk on her streets quickly reveals that here too, alcoholism terrorizes many inhabitants. 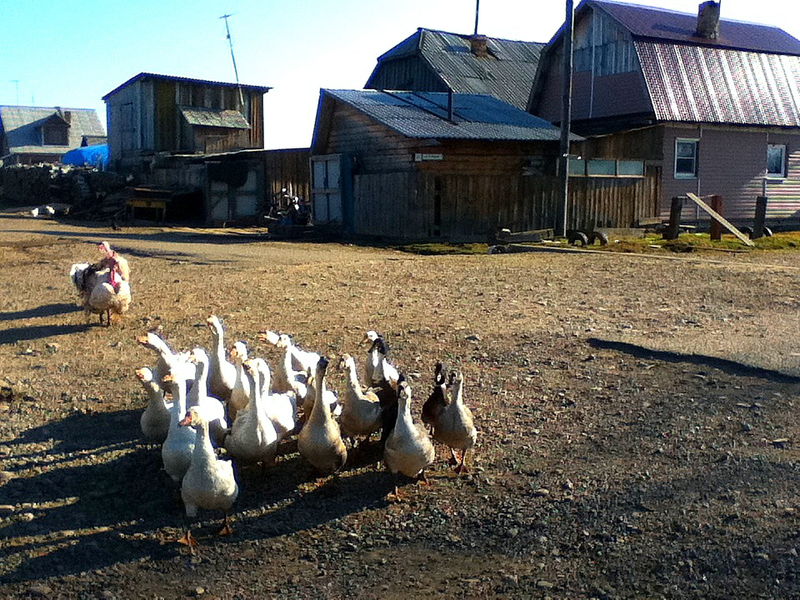 I went out to visit my friend Oleg, who lives in Little Big River. 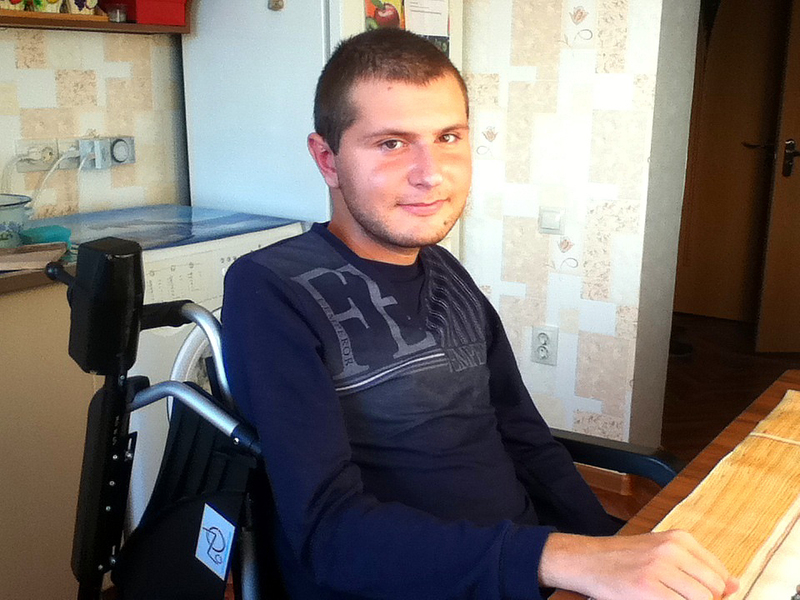 Oleg has a big smile to go with his bigger heart, and he uses them both as he attends to people’s needs. He is a humble servant dealing out God’s love where it is needed. Oleg, crook turned saint is a hoot to hang out with, his former life giving vivid humor to his current reality. I invite you to come along to visit Little Big River with Oleg and I. Welcome! From Irkutsk, to reach Little Big River, you first have to head to the “Avtovokshal”, or the bus station, a bustling place of here and there goers. Buses and mini-vans headed to all points in the region sit in obvious or not so obvious locations waiting to load up and hit the road. At the Irkutsk bus station if you ask any local taxi driver where to catch the next ride to Little Big River he smile helpfully and answer: “Oh that bus is rescheduled and won’t leave until 7 pm, but I can take you right now for an extravagant fare!” Yup. I found a mini-van and was on my way in ten minutes. A forty minute ride, and 80 rubles lighter, I stepped out of the mini-van at the central bus stop none the worse for wear. 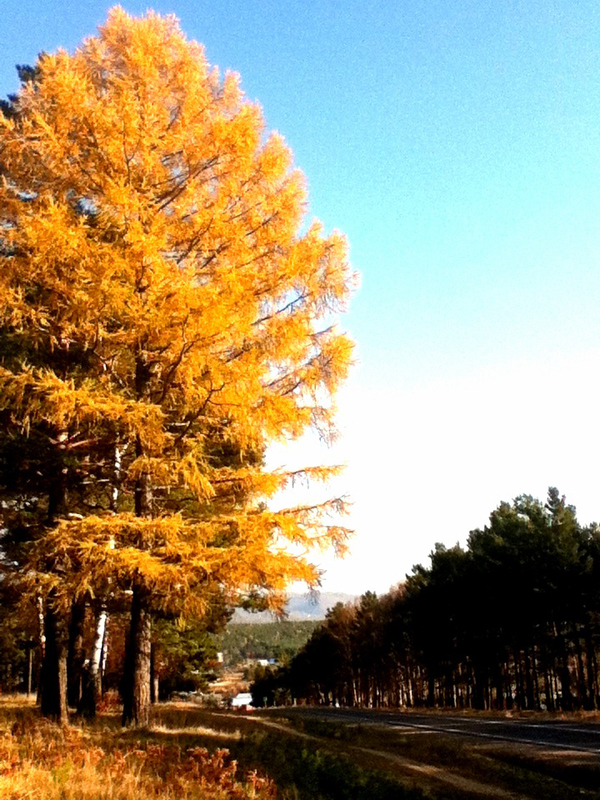 The central bus stop is up on a hill next to some huge larch trees. No one was there. No sound but the wail of the steppe wind blowing down the hill. And then, yes, just there, the distant howl of a wolf. No, no no! No wind, no wailing wolves. Just a funny central stop on top of forested hill. So off I set, down the hill . . . I hooked up with Oleg, and we made our way down to the waterfront where the boys spend their nights four abreast on a padded plank in the snug wood-fired cabin. Ray, the faithful German Shepherd mix stands constant guard to ward off hooligans and drunkards. At the cabin I met Dima (or Dimon), the man who rustles up the grub. Dimon had a colorful history, which included lots of travel back and forth from Central Asia to Russia during Soviet times in the leaf trade. Yes, I mean marijuana. After the wild times, he ended up in a small village digging graves in the graveyard where he lived. When Oleg offered him the chance to come to Little Big River, dry out and hold down the fort, he did not bat an eye. In the midst of what would best be described as a settlers cabin, Old Dimon had a flash drive hooked into a disk player where he played “Yanni Live! The Concert Event” from 2004 continuously on the TV. 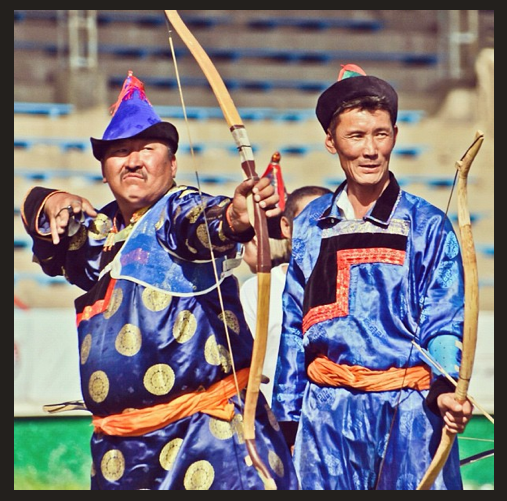 Yanni would work his concert musicians into a fury and as the dueling violinists bows started smoking, Oleg and Dimon would sit entranced. Dimon told me when he watches it by himself it brings him to tears. He said, “When I listen to this music, God uses it to change my heart.” I could feel what he meant, cause my heart too was awed by the rapturous music. We’ll have to take violin lessons in heaven Dimon. Just two houses down was a site quite unexpected to me in any village. 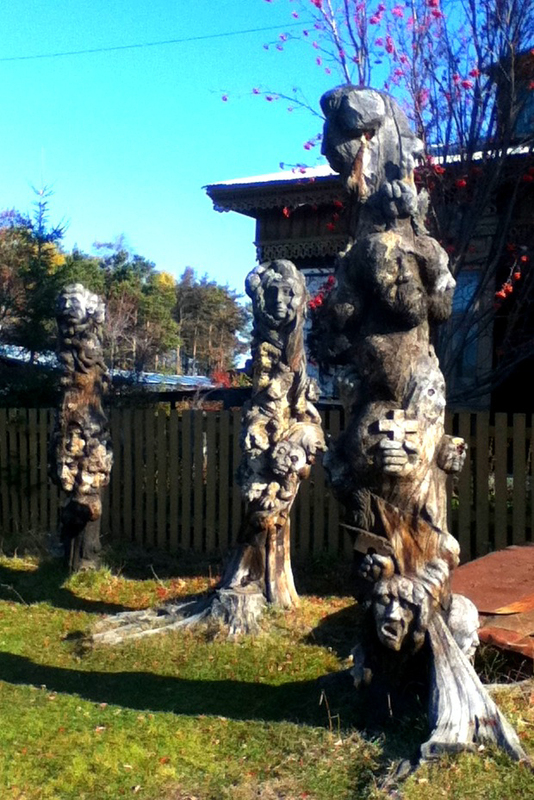 Before a quaint looking dwelling stood something like totem poles peppered with faces including Stalin, Beria (head of the NKVD under Stalin), and Lenin. 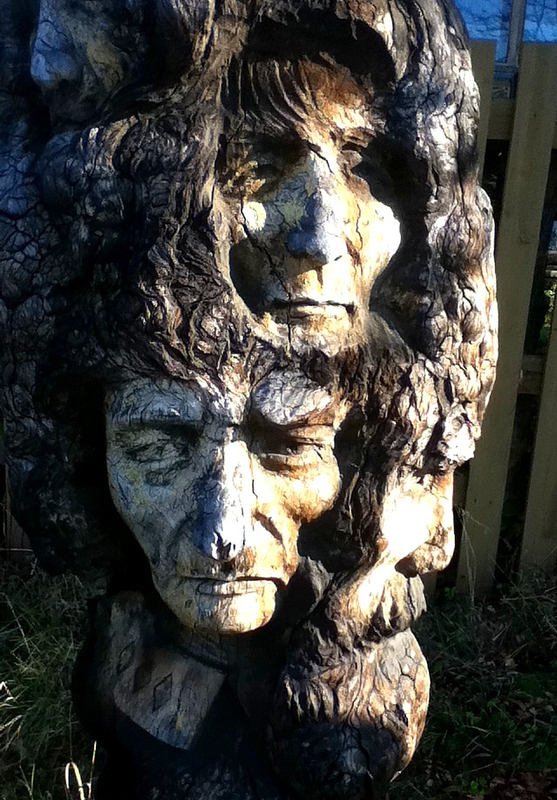 Each pole carved with a theme: the gulag, the repetition of world history, and an allegory about the path of youth. 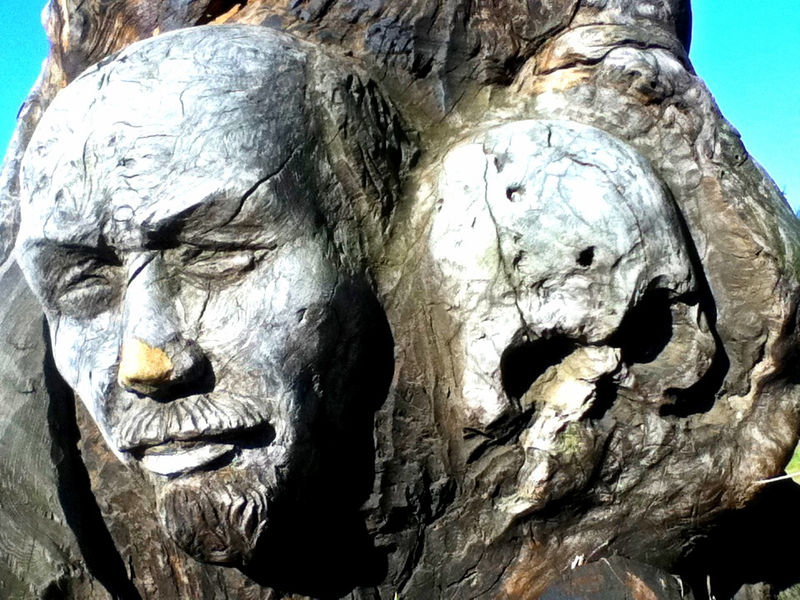 Having survived Stalin’s gulags an artist carved his angst and anger for all to see. Dimon asked if I would like to meet his wife, Nadezhda Lukinevna. Entering, we were met by a beaming eighty-five years young Ukrainian. With a pleasant garnishing of wit, Nadezhda Lukinevna, who is sharp as a knife, shared the history of her family, husband and their home. 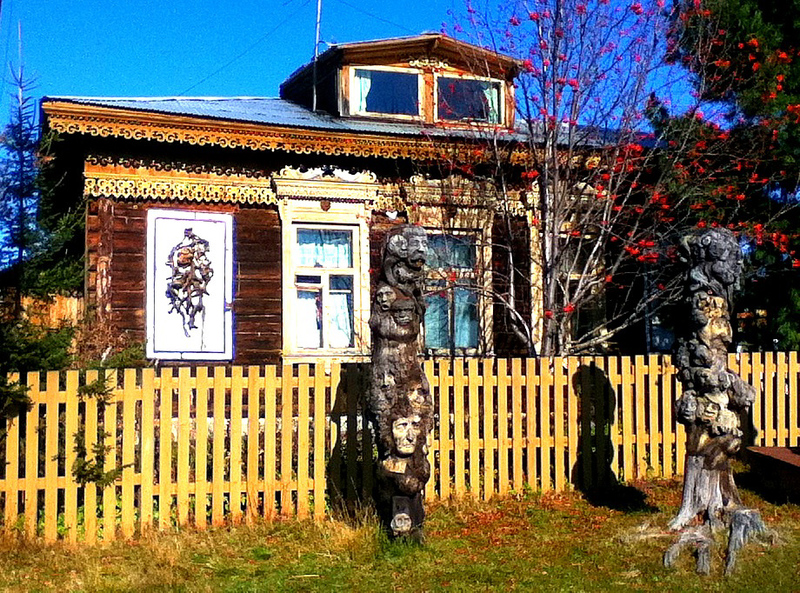 Built by a rich tea merchant, their home had once stood in Irkutsk. In the early 80’s they had managed to attain the house, whereupon they took it apart, moved it all to Little Big River and reassembled it. In the USSR at that time it was difficult to attain building material, so moving a home was the only option. The home, with unusually high ceilings, beautiful pre-revolution furnishings, and a warm brick stove, is filled with books, blooming violets, paintings of Lake Baikal, and carved wooden lamps and figures. It’s a gallery, garden and library all in one. Ensconced in the toasty kitchen with a hot cup of tea, I listened to Nadezhda yarn while peeling potatoes for dinner. Bless you Nadezhda, dinner was great. The next morning having drank several cups of hot tea and scarfed some eggs Dimon whipped up; I went to reconnoiter the village while I waited for Oleg. 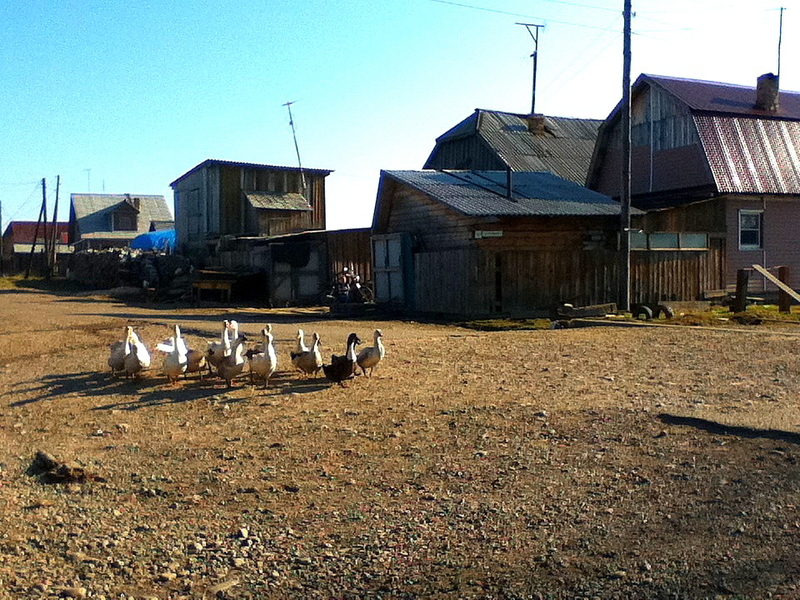 Typical things you will come across in a village in Siberia are: 1. Everyone’s property is fenced in. 2. Behind those fences is at least one dog, who considers it his life’s mission to raise his voice in offended protest of your very existence. 3. You always seem to witness at least one cow banqueting in garbage bins. 4. 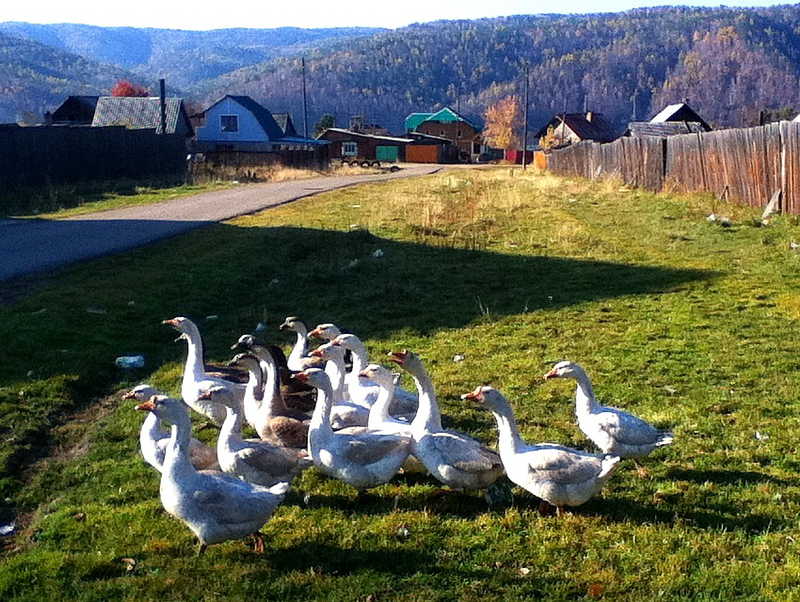 A gaggle of geese giving beak to the same feelings about your visit as the dogs. 5. Several weather darkened homes whose sag is gravity defying. 6. Shops with names like; Shop # 1, Shop # 2, Shop # 3, and Rainbow. After congratulating the garbage cow (see post LBR Boys # 2 below) who adeptly lifted a bag from the bin up, up, then swinging it downward, used weight + centrifugal force to tear open the plastic exposing lip smacking contents, I ran afoul of the fowl. Yes, my reward for going two blocks out of the way to goggle a gaggle of geese feeding suspiciously near waste bins, was an out and out attack launched at my very person by the local toughs, geese (and several rough sidekick ducks.) My presence, sinister as only geese know how, kicked up quite a dusty ruckus, as geese madly dashed away, flapping wings and trumpeting as if I’d come to dispatch one of them for supper. 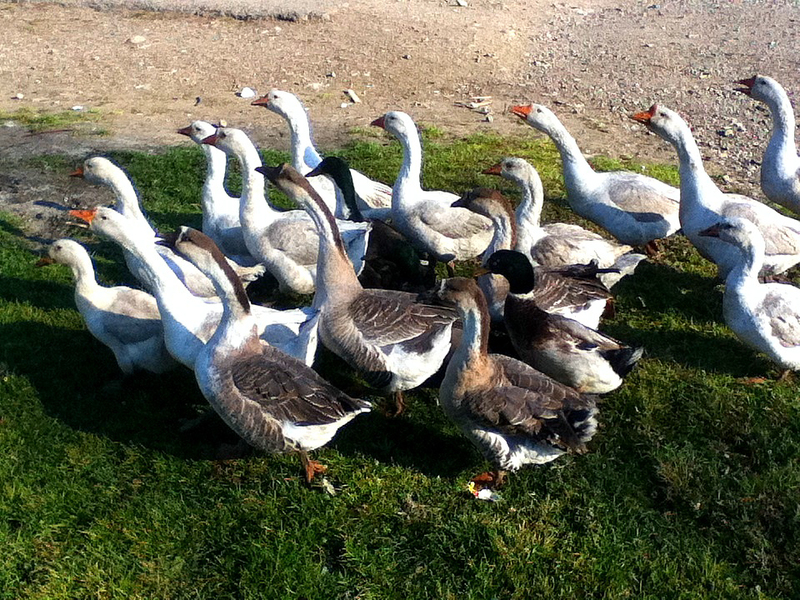 Gathering in a herd, they swung round, beaks blaring like a traffic jam in Delhi, and charged my position! As the assault drew nigh, I did what any quick thinking young man might do. Grinning in the teeth of peril, I swiftly drew my weapon, an 8 gig matte black iPod, light, but deadly accurate, and setting it to “photo” recorded the charge for future tactical study of geese attack formations. That big mass of noise, upon apprehending that I would stand my ground, at the last moment careened off my port side and racketing all the way, looped around me. 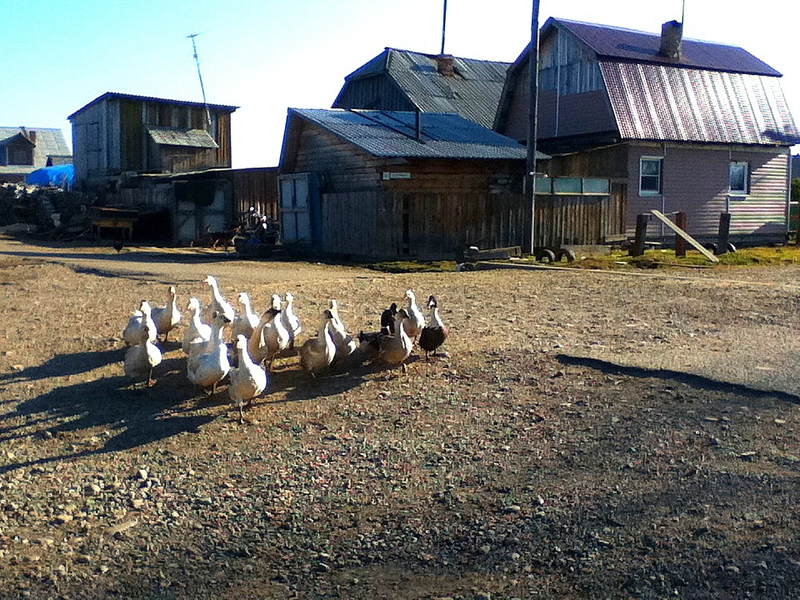 Their assault deemed a success (I guess), they went back to bickering over orange peels and I strolled back to the house chuckling at the silliness of village geese. 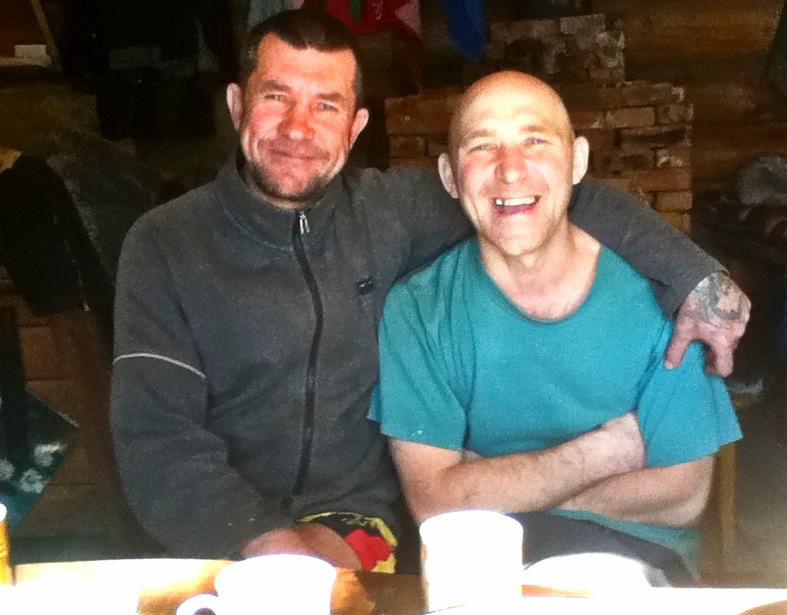 Oleg collected me after lunch and we went to visit Pasha, who is wheelchair bound. Pasha is a handsome, frustrated young man. No one knows exactly what happened to him accept that when he was roughly seven, his muscles started atrophying, and he went from playing in the streets, to difficulty walking, to wheelchair. I spent a number of hours hanging with Pasha. Village life can be mind bendingly boring when you are stuck in a chair. A person who has time to listen is always encouraging. Pasha is enrolled in a distance learning class to get his accountants degree. He told me about life before and after the chair, his struggles, his friends who live far west in the village where he was born, and he shared pictures with me of the family trip to the Black Sea this summer. That is three thousand miles as the crow flies, much further by auto. 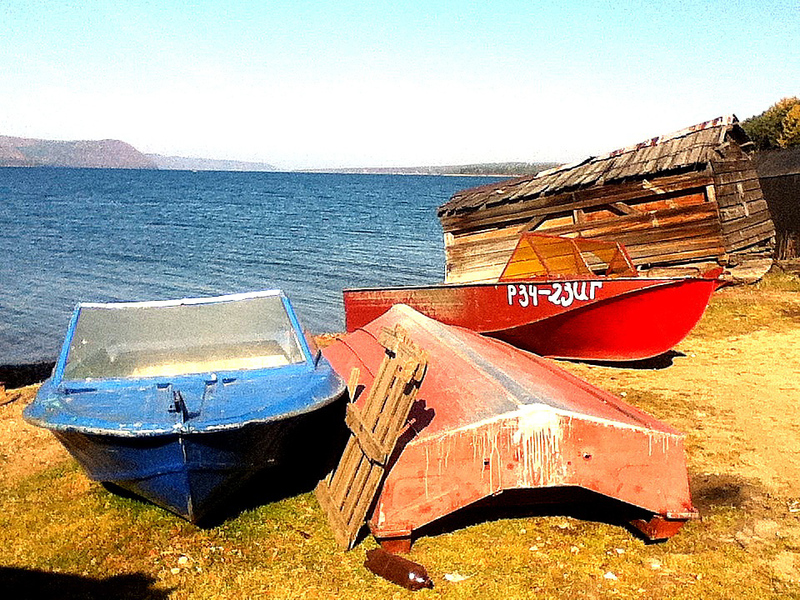 And that is how Pasha travelled all the way from Central Siberia to Anapa, on the Black Sea coast! Flipping through his photos on the computer, Pasha was a bit embarrassed when a few photos of young beach beauties popped up. I just about wanted to cry, cause I could sense the despair of a young man who wants to win a beauty, BOUND TO THE SENTENCE OF A CHAIR. AAAAAAARRRRRRGGGGGG!!!! I told Pasha, “Pasha, if you are angry, let your Maker know, don’t hold back. Better some smoking words, which He in his infinite grace will lovingly forgive, then lip service which is fake.” Remember Pasha in your morning petitions. Pasha’s parents came home, a thoroughly joyous bunch, quite pleased to see someone spending time with their boy. Dinner was ready in a flash, fresh omul caught the night before on Baikal, and they sent me on my way after many laughs with a bag of fresh carrots, and six salted fish. Can it get any better in Little Big River, or anywhere? No friends, it can’t.